"Superman versus the City of Tomorrow"
Superman invades the home of Mr. Glenmorgan and quickly dispatches Glenmorgan's guards. The police arrive to stop him led by Detective Blake. Superman stands on a ledge and hoists Glenmorgan over his head. He refuses to let go until Glenmorgan reveals all of his illegal activities. Suddenly he dives off the ledge while holding Glenmorgan and once they land the rat, as Superman called him, agrees to make a full confession. Superman escapes as the police open fire. Elsewhere Lex Luthor and General Sam Lane track Superman from a military base. Luthor talks about Galileo Square and how it makes such an ideal trap for Superman as the two men watch footage of Superman saving people from a seemingly runaway wrecking ball. The military arrives and attacks but with the help of the people he saved Superman escapes. Superman heads to a rooftop and changes back to Clark Kent. He makes a brief stop at his apartment where he talks to his landlady and pays his rent. After leaving he calls Jimmy Olsen who is with Lois Lane chasing down one of Glenmorgan's enforcers on to a public train. Knowing that the trains are dangerous Clark tries to get Jimmy and Lois to leave and has to change into Superman when the train runs wild thanks to Lex Luthor. The train crashes, which upsets Lane because of Lois' involvment but Lex is unconcerned and leaves after seeing the footage of Superman pinned by the train against the front of the Daily Planet building. Story - 4: There are two things about writing this review that are very, very strange for me. Surreal might be a better term but strange works just as well. First, September 2011 marks the tenth anniversary of me writing for the Superman Homepage. Back in 2001 I emailed Steve Younis and inquired how one goes about becoming a reviewer for the site. He wrote back asking for a sample and soon I was kicking out long winded reviews of JLA: INCARNATIONS and eventually SUPERMAN & BATMAN: GENERATIONS II. 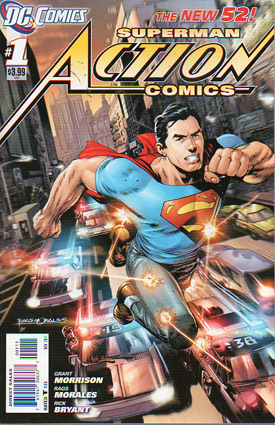 There was a very brief period in the beginning of 2002 where I had to step away from writing reviews for personal reasons but after coming back I wrote reviews for a whole bunch of the specials and mini-series that DC was publishing at the time until I finally landed a regular assignment in the form of SUPERMAN/BATMAN. So there's this weird bit of serendipity that right here at the ten year mark I start reviewing ACTION COMICS. 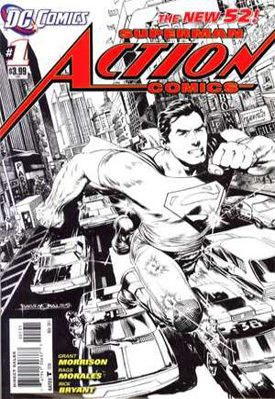 The second bit of business that makes writing this review strange is that I am actually writing a review for ACTION COMICS #1. My first instinct was to begin this review by pretending to review the first ACTION COMICS #1 from 1938 and write something like, "What? 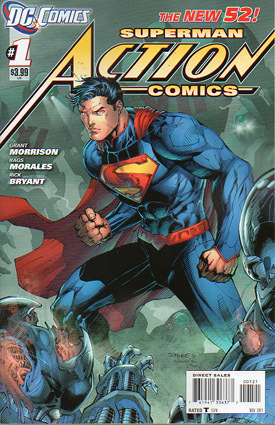 That's not the ACTION COMICS #1 I am supposed to be reviewing?" and then move into the real review but as I kicked the idea around in my head it seemed like a pretty lame gag so I ditched it. Still, this is an historic comic book and I can't help thinking of John Byrne's MAN OF STEEL #1 in relation to this issue. Comparing the two beyond the fact that they are both re-launches would be folly but I firmly believe that all of the anger and excitement and resentment and so on that fans are feeling and expressing now has to be similar to the anger and excitement and resentment and so on that Superman fans and comic book readers in general felt back in 1986. While thinking about all of that excitement and anger I started to wonder how I would have felt about this re-launch before I spent nine months away from the monthly Superman titles. I am convinced that the time away gave me a new perspective on how I feel about the comic book adventures of the Man of Steel. It's not a better perspective or even the "right" perspective but I think it allowed me to accept the change going on around me which, in turn, allowed me to enjoy this first issue. The me of 2009 would have definitely bought and read this issue. I may have even liked it but I think I would have resented the fact that "my" Superman was being done away with. Stepping back from the week to week grind of comic reading allowed me to gain some sense of closure on "my" era and made me realize that this is how it is supposed to go. Every generation deserves its own Superman both on the screen and in the comics and I think that one of the bigger mistakes my generation and the generation before me has made is that we hold on to what we loved as a kid or young adult to a nearly absurd degree to the point that the very idea of any change brings forth bile and venom and threats of revolt. For me personally I've come to the conclusion that as long as Superman does the right thing because it is the right thing to do and fights for truth and justice then I will more than likely enjoy it. And boy did I enjoy this issue. It helps that I like Golden Age era Superman. There is something very raw and powerful about those initial adventures. They may not always make sense but I like the idea of a Superman that is not as powerful as he would eventually become dealing out a two fisted justice based on sticking up for the little guy. There is something safe and reassuring about the Superman that works a little closer with the system but I love the idea that he starts doing that later in his career when he's a little more mature and settled. A Superman acting more like a true vigilante in the early days makes a lot of sense because he hasn't figured out how to do what he wants to do. He sees something as being wrong and does something about it without worrying about the consequences. That is the Golden Age Superman to me and that is the Superman Grant Morrison has given us. Even the title of the story, "Superman vs. The City of Tomorrow" sounds like it came from the Golden Age. In the first scene Superman breaks into what looks like a penthouse apartment and terrorizes a world class scum bag which brings him into conflict with the cops, which works just as well today as it would have in the late thirties and early forties. This opening sequence went a long way to making me like not only this issue but this "new" Superman as well. He's a very passionate character that has a definite sense of right and wrong. He's also a lot of fun. Superman smiles a lot through the course of this first scene whether he is torturing Mr. Glenmorgan or running from the police. That attitude makes him very likable and more than a little relatable. He does things that a lot of people would like to do but what seals the deal for me is that he is fighting his fight for the common. The Clark Kent we meet in this issue has a lot going for him as well. I think Clark's personality is more of how the character actually is on a day to day basis. Being Superman allows him to let out his inhibitions but as Clark we see the guy raised in Kansas trying to make his way in the world. The scene with his landlady was a great way to introduce the character and then to introduce his friends. Well, maybe friend would be the better way to describe it. I also absolutely love that Clark seems to be working for the Daily Star under George Taylor before eventually becoming employed at the Planet. That is a great touch and rises above a simple reference. I am interested in finding out where the Daily Planet stands up as a paper in this new continuity. In SUPERMAN: SECRET ORIGIN it was on the verge of folding but I almost hope that in this new world it is the shining example of journalism that wouldn't employ Clark at first so he went to a rival paper until something happens that leads him to being hired by Perry White. I really liked Jimmy in this story and have no issues that he and Clark seem more like contemporaries. Jimmy calls Clark his best friend for the past six months and that one line tells me all I need to know about how the two characters relate to each other. So far I like Lois as well. She seems so focused when it comes to chasing down a story that she almost looks distracted. This Lois seems to get so lost in what she is pursuing that she can't see things like a train going out of control. As long as she isn't completely dismissive of Clark when they finally end up working together I will be fine. The only major quibble I had with this issue was Lex Luthor. Lex doesn't feel all that different from the Lex we have seen for the past few years and that was a real disappointment. Sure he had some definite "Morrisonisms" about him, like his sipping an energy drink in the middle of talking, but overall I am not seeing anything that will separate this Luthor from the previous versions we've seen. This could change. It is only the first issue after all but this was the one part of the issue that I didn't like at all. Other than that ACTION COMICS #1 was a fantastic way to kick off this new era of Superman. There were big moments such as the opening scene and Superman rushing to save a train full of people and then there are the smaller moments like the Legion of Super-Heroes reference during Clark's conversation with his land lady. The real test comes in three weeks when the first issue of the new SUPERMAN title comes out. If that book is anywhere near as good as this one I will be a very happy Superman fan. Art - 4: I have been a fan of Rags Morales' art for quite some time now. While IDENTITY CRISIS was far from his first professional comic book work it was the project where I started to take notice of his style. Oddly enough I never really cared for his Superman. He always made him a little too... beefy for lack of a better term. Corn fed might be a better way to describe it. The Superman presented in ACTION COMICS is 180 degrees away from that and even though this isn't the traditional suit or even the new traditional suit Morales makes it look iconic nonetheless. More than that I love the amount of personality he has Superman show throughout this issue. You can tell at the beginning that Superman is enjoying the justice he is dishing out. I like the new Clark Kent as well. The baggy shirts work well to disguise his physique and Morales makes the big, circular glasses work in ways Gary Frank could not. I liked the other character designs as well. Lois has an almost distracted look on her face through the first bit of her screen time which is a nice contrast to how focused she is on her prey. She's attractive too but not, to paraphrase Clark Kent in MAN OF STEEL #1, like a movie star. There's life in her eyes and I look forward to seeing more of her in this title. Jimmy looks fine but I would have preferred to see the freckles. Depending on the panel Lex Luthor looks like Michael Rosenbaum or the Lex from SUPERMAN: THE ANIMATED SERIES, which is not a negative criticism by any stretch of the imagination. One of my favorite random bits of art was the scene where Gus Grundig pulls his guns on Lois and Jimmy. He looks like The Spirit if Jack Kirby got a hold of him and that thought made me chuckle a bit. The one weak spot for me artistically speaking was General Lane. His look changed from panel to panel, which I thought was extremely distracting. Other than that this was a very strong first issue both in terms of writing and art. Morales is a good choice for this title and I am looking forward to seeing what else he will bring to the table. Cover Art - 4: I like this cover a lot. Superman looks great and I like that bullets are bouncing off of him. That says classic Man of Steel to me. My one and only issue is the blur effect. If I look at the image too long it actually gives me a slight headache. Otherwise I am down with this cover. Variant Cover Art - 4 (Jim Lee): This is a fine cover but I would have preferred Jim Lee's take on the costume we see inside the comic instead of the "future" one. I like the new costume so it is quite cool to see a full color preview but it feels out of place here. Also it looks very similar to the last page of JUSTICE LEAGUE #1 so I feel like I've seen this image already. Variant Cover Art - 5 (Black and White): This cover is a great showcase for Morales' pencils. I love the level of detail he put into the backgrounds, which is just lost in the color version. This variant proves that the "special effects" of the standard cover really don't need to be there.